Last week we provided an update on new federal regulations clarifying the implementation timeline and requirements for the federal Every Student Succeeds Act (ESSA). Of note was the decision to delay the submission deadline for state plans to afford state agencies more time to meaningfully engage and gather input from stakeholders. This has been a priority activity for many states over the past several months. As state agencies have worked to draft and finalize their ESSA plans, many have made use of surveys, focus groups and listening tours to gather feedback from students, parents, educators and other relevant stakeholders. To date, draft ESSA state plans are available for public comment in 10 states (though several others have released draft components): Arizona, Delaware, Idaho, Illinois, Louisiana, Montana, North Carolina, South Carolina, Oklahoma and Washington. At this point, several states have proposed strategies to leverage ESSAâ€™s accountability requirements to encourage and expand quality career pathways through a College and Career Readiness indicator (CCR). California is a notable example, having adopted a such a system in September, though other states are considering this as well. Based on feedback from stakeholders, Delaware proposed a â€œCollege and Career Preparationâ€ indicator that includes the percent of students demonstrating postsecondary preparation through CTE pathway completion, dual enrollment, and other academic indicators such as Advanced Placement, International Baccalaureate and SAT exam scores. Additionally, Oklahomaâ€™s state plan proposes using industry credential attainment, along with AP/IB, as one measure of student access to postsecondary opportunity. And in South Carolina, the Department of Education designed its ESSA plan around a 90 percent college and and career readiness goal for graduating students by 2030. As an interim measure of progress towards this goal, the plan proposes adopting a â€œPrepared for Successâ€ indicator that measures high school studentsâ€™ scores on WorkKeys assessments, participation in Youth Apprenticeships, completion of state-approved CTE pathways and industry credential attainment. This list is by no means exhaustive, but nonetheless provides a snapshot of how some states are approaching this opportunity. 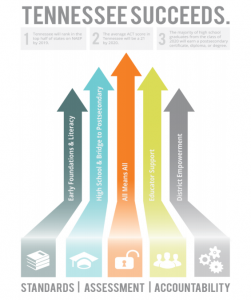 In response to its cross-state listening tour, Tennessee released an update on its ESSA plan development, reporting that one of the priority themes from the listening tour was creating a bridge to postsecondary. As such, Tennessee aims to leverage its ESSA planning to encourage and expand access to early postsecondary opportunities, including industry credentials and postsecondary credit attainment. In compliance with ESSAâ€™s requirement of challenging state standards and assessments, the Montana State Board of Education in November approved an updated standards review schedule to ensure that standards in specific program areas are regularly reviewed and revised. The first cycle of review, beginning in 2016, will examine standards for CTE, Digital Literacy, and Computer Science. Washington Stateâ€™s plan proposes utilizing the stateâ€™s High School and Beyond Plan as a strategy to support student learning and achievement. Students develop their High School and Beyond Plans in middle school with support from family members and school based counselors. The Plan identifies the studentâ€™s interests and abilities and defines a plan that is linked to his or her career goals. With ESSA state plans due to be submitted in 2017, many states have yet to formalize their strategies under the new K-12 education law. Advance CTE Â will monitor state plans and proposals as they are released to share emerging strategies and opportunities to leverage the law to advance career readiness and CTE as ESSA continues to be implemented over the coming years. This entry was posted on Tuesday, December 6th, 2016 at 7:55 am	and is filed under Public Policy, Uncategorized. You can follow any responses to this entry through the RSS 2.0 feed. Both comments and pings are currently closed.